John Cena is a professional wrestler with WWE, who has firmly established himself as a fan favourite. He’s branched out in several directions, with acting roles, TV presenting, and rapping all part of his career. Who is John Cena, how old is he, when is his birthday, how tall is he, where is he from, what did his parents do, what is his background, is he English or Irish? 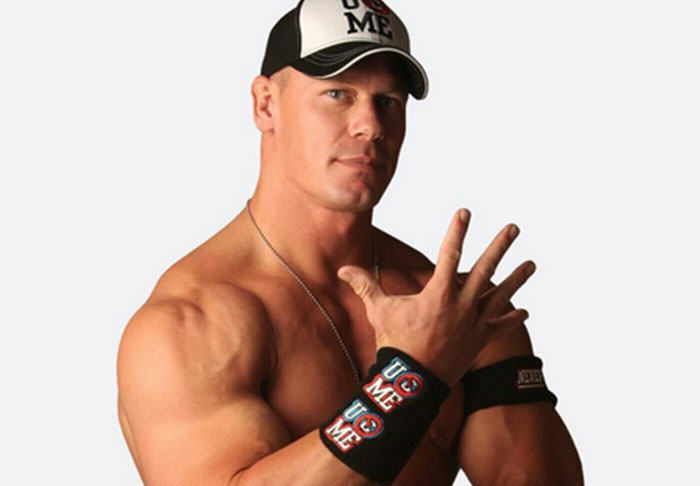 John Cena is a pro-wrestler, TV and movie star, and rapper. Born on 23 April 1977, he’s 41 years old. Cena stands at 1.85m tall. He was raised with his four brothers in West Newbury, Massachusetts, by his mother Carol and his father John Sr., who was a businessman, Justice of the Peace, and wrestling announcer known as ‘Johnny Fabulous’. His father is of Italian descent, and his mother of English and French-Canadian descent. Cena’s maternal grandfather was major-league baseball player, Tony Lupien. Cena started a career in bodybuilding after college, then began training as a pro-wrestler in 1999. Why is John Cena famous and what is his occupation? Having started in wrestling as the character ‘The Prototype’, then ‘Doctor of Thuganomics’, once Cena began wrestling under his own name, he became a fan-favourite in the WWE world. Having now diversified his career, he is becoming a household name to those unfamiliar with wrestling, for his acting and TV roles, as well as his charity work with organisations such as the Make A Wish Foundation. How much is John Cena’s net worth? Website The Richest estimated Cena’s 2017 net worth as being $55million. How much does John Cena earn? Forbes reported that Cena’s 2017 earnings were $8 million, making him the second-highest earner on their ‘Highest paid wrestlers’ list. How much does John Cena weigh? Starsunfolded.com reports that John Cena weighs 250 lbs, or 113kg. Where is John Cena now, what is his real name, did he die? John Cena is currently still active in his career. His real name is John Felix Anthony Cena. He is alive, although persistent Twitter rumours have circulated claiming that he died from a head injury sustained during a match with The Rock. Is John Cena married now, who has he dated in the past, is he dating Nikki Bella, is he engaged to Nikki Bella, did he get divorced, does he have kids, how old are they? John Cena was married to his high-school sweetheart Elizabeth Huberdeau from 2009 to 2012. He was rumoured to have been involved with wrestler Mickie James during his marriage, along with several with other women. He and Nikki Bella got together in late 2012. 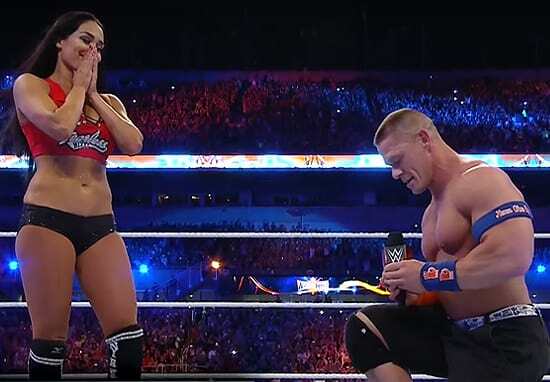 On April 2 2017, Cena proposed to Bella in front of millions of fans during WrestleMania 33. The pair announced their split almost exactly a year later. Was John Cena in the military, is he a veteran, what movies was he in? He has never been in the military and is not a veteran. After his first major movie role in ‘The Marine’, his wrestling persona was changed to a young private. Cena has starred in Trainwreck, Daddy’s Home, and Ferdinand, among others. Who has John Cena fought in wrestling matches, how many fights and WWE Championships has he won, what are his most famous matches, is he coming back to WWE, how long was he in the WWE? The wrestler has gone toe-to-toe with The Rock, Batista, Brock Lesnar and many more. His most famous battles have perhaps been with Randy Orton, with whom he has a notoriously intense rivalry. He’s wrestled in an impressive 2,194 matches and has won 1,733 of these, along with winning 25 championships over a WWE career spanning 18 years. Has John Cena retired, is he broke? Cena has not retired and has been an active member of the WWE roster in 2018. There are no reports to suggest he is broke although Cena is apparently a lavish spender, who enjoys buying muscle cars. Does John Cena have any children? John Cena has no children.